In just a few short days, tens of millions of people from around the world will once again celebrate the birth of the long awaited and prophesied Christ Child - the babe born of poor, unmarried parents in an animal's manger in a world filled with confusion, fear and violence. I am always in awe of the magnificent tapestry of God's love for mankind as told by the Holy Scriptures. The details of the Scripture are rife with symbolism and intricacies that only the Divine could weave. Recently I came across an insight on the conception and birth of Christ that was new to me but maybe not new to you, so please bear with me as it stands repeating. The Christmas story, as told in Luke Chapters 1 and 2, contains the details of the birth of Christ in a consecutive order. This is different than the other books renditions, perhaps because it better fit the storytelling style of Luke, a physician. Luke speaks of the role of Gabriel in announcing Mary's condition, his attempt to calm Mary's fear and dismay, and his explanation of other miraculous births, citing the pregnancy of Mary's aging barren cousin Elizabeth. Immediately upon Gabriel's departure, Mary goes to the hills to find her cousin, Elizabeth, whose hideaway protected her from the talk of the village. Mary needed to see for herself that the elderly Elizabeth was indeed pregnant. And, upon seeing Mary, Elizabeth feels her baby "leap with joy" at the presence of the Messiah in Mary's womb. Even in utero, according to Luke 1:41-44, Jesus' cousin, John the Baptist, knew Him. Mary was just told of her condition, the babe was barely grown enough to cause a bulging belly, yet His cousin, six months formed in his mother's womb "lept with joy!" The tapestry of Scripture unfolds in a most unusual way with the most miraculous story of the pregnancy of Mary, followed by a trek to an unknown town with many denying the Christ child access to shelter, even before His birth. Joseph and the laboring Mary were left with no other option then to give birth to the King of Kings in a stable. Animals surrounded the young family and their feeding trough served as the bed for the Prince of Peace. 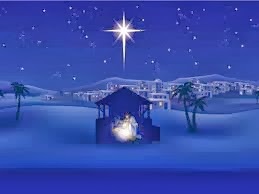 And despite this quiet, unheralded birth of the Savior of all mankind, the heavens took part and shone a star of a most unusual proportion to guide both the poorest of poor and the richest of rich to the Stable, if they would only follow it and believe. Today, in world not so unlike the world of Jesus - confusion, fear and violence abound- Jesus' quiet invitation to follow Him is available to all - the poorest of the poor and the richest of the rich and all of those who are weak and heavy laden. He loves us all and loves us enough not to force a relationship but to invite us to a relationship with Him, so that we can understand the Father who sent Him. Will you accept His invitation once again? Will you renew your relationship with Christ this Christmas season and find the peace that will only come from Him? I rest my soul in His hands and wish you the most blessed of Christmas seasons.